Memories are made up of the elements of life’s experiences. These elements are woven together to form complete representations. It is the memory, which is passed around in our brain, as we experience something new. It is the memory of past experiences and current events that influences our thoughts and feelings of the day. You might ask, “How can memory be so important, especially if you keep focused in present time?” The answer lies in the nature of perception. Everything that we know is composed over time through a series of actions. Taking an example from the visual system helps explain how the mind works with memory. The eyes focus on a limited amount of detail at one time. In order for you to see the face of someone standing in front you, the eyes need to sequentially scan the elements of the person’s face. The outline of the hair is generally where the eyes begin gathering information for memory. Next, the eyes move to the person’s nose, then the mouth, followed by the chin, the eyes, and finally the eyebrows. The clear picture of a face, the one that you see in your mind, is really a composition made up of all of these elements of the face. The face that you see comes alive in your memory. The sum of the elements of a face is meaningless; without the form that we all know as a face. The meaningful conclusion to scanning a face is a whole face made up of the parts that have been viewed. Once formed, memory begins to influence our sense of well-being and understanding. With memories of important aspects of the world and people around us, we can better understand the world and plan our activities. Connecting people with places is similar to snapping together pieces of a puzzle. When the pieces fall into place; we have a sense of satisfaction, happiness, joy, or at least a greater understanding. The connection of the pieces of a puzzle gives us some sort of feeling, which goes beyond the knowledge that something or someone exists. This personal sense of experience connects the mind to emotion. The brain is the organ of conscious and unconscious activity. Within the brain, there are specific areas that support the formation of new memories. The most famous area for memory formation is the hippocampus. The hippocampus is similar to the eye, in that each side of the brain has one hippocampus. The hippocampi extend forward within the temporal lobes on either side of the brain. The hippocampus is part of a group of deep brain structures; which support long term memory, emotion, behavior, motivation, and the sense of smell. Collectively, these deep brain structures are known as the limbic system. Primitive processes of sensation, perception, and activation are provided by the limbic system. Located along side of the forward area of each hippocampus is an almond-shaped structure known as the amygdala. The amygdala is engaged whenever we process memory, make decisions, or experience an emotional reaction. Medical reports have linked the loss of hippocampal activity to the inability to form many types of new memories. Damage to the amygdala has been shown to flatten the personality. The ability to sense emotion and affect is diminished, when amygdala function is impaired. On the bright side, one study showed an increase in the volume of the hippocampus for taxi cab drivers in London. The increase came over time as drivers learned ways of efficiently traversing the city. In this case learning, which was tied to professional performance, actually increased the size of the memory formation engine that is the hippocampus. The increase was not entirely uniform. As navigational experience increased over years, there was an increase in the right posterior hippocampus and a reduction in the size of the right anterior hippocampus. The right hippocampus became larger in the back and a bit smaller towards the front of the brain. The things that we do in life shape our brains. The hippocampus and amygdala exist side by side. 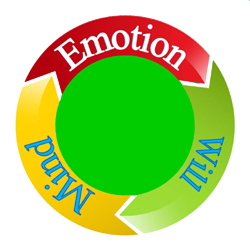 Anatomically, the organ of memory formation lies near the organ of emotion. The forward end of the hippocampal formation connects with an almond-shaped structure known as the amygdala. Memory is the power that drives the amygdala to whatever high or low is experienced. It is the mind with the ability to make and manipulate memory, which drives the emotional systems of our brain. We know the memory processor is the hippocampus. We also know the emotional expediter is the amygdala. The connection between the memory processor and the emotional expediter is memory. Memory is organized within the domain of the mind. The location of the amygdala near the anterior end of the hippocampus supports the organization and flow of information from the mind to the emotions. The will to do something is an outgrowth or our memories, experiences, emotions and expectations. 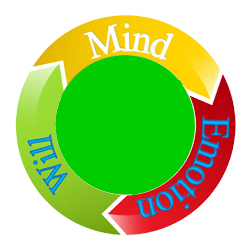 What we know, both consciously and unconsciously, is tapped by the will in order to determine the level of our drive to move toward a goal or activity. The will influences where our eyes go, what we hear, taste, and smell. Through the will, the circle is complete. The mind provides memories to the emotional systems. Together the mind and the emotions figure into the decisions that we make. These decisions and actions provide life experiences, which the will takes into account. 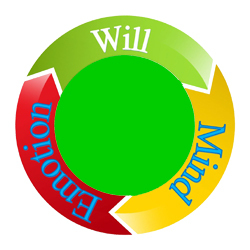 The will adjusts the course of life to achieve what we really want out of life. Fastenrath, M. et. al. (2015). Dynamic Modulation of Amygdala–Hippocampal Connectivity by Emotional Arousal. Journal of Neuroscience, October 15, 2014 • 34(42):13935–13947. Maguire, E.A., Woollett, K. & Spiers, H.J. (2006). London taxi drivers and bus drivers: a structural MRI and neuropsychological analysis. Hippocampus. 2006;16(12):1091-101.